A few years ago I wrote a book about killing mind-numbing presentations before they kill us first. If you’re in the business world, I’m sure you can relate to that little dilemma. Check it out on Amazon! Once you’re done with the book, be sure to come back and grab the Combat Kit. 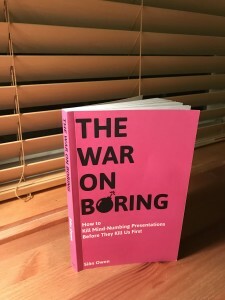 It’s a free, 32-page supplement to the book, containing helpful tools and exercises to kickstart your personal war on boring.